Writing is part of every clinician's daily work. You write chart notes, treatment summaries, reports, letters to other treating professionals - and that's just the basics. 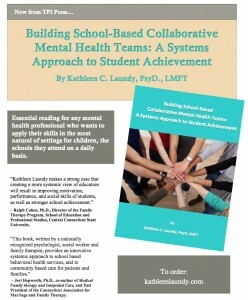 From time to time you may compose articles, blog posts, book chapters, handouts and other materials. Word processing programs such as Microsoft Word, Pages and Google Docs have dozens of tools to streamline routine writing tasks. But aside from Copy and Paste, you may be unfamiliar with useful features that could save you time, as well as avoid careless errors. Here are a few ways to make your writing time more efficient. Most word processors have a built-in autocorrect function that instantly fixes common spelling errors and changes certain symbols to those that are typographically more attractive, such as substituting an em dash for a minus sign. Did you know that you can create your own autocorrect content? And it can apply to lines of text, not just individual words. You can use any sequence of letters or key combinations, or even a single letter. Just make sure that it's not an actual word that would appear on its own. Otherwise, every time you type it, it will automatically change to the above. Autocorrect functions can expand short letter sequences into entire paragraphs or lists that you use frequently. This comes in handy, for example, if you routinely list Wechsler subtest scores. Type the list of subtests, save it, and paste it into your next report. You'll never have to type out the list again. Just plug in the current client's scores. Most word processors also have menu options to add common elements such as the date and your signature block. You can customize these, and later select them from the menu to paste them into your document. Where to find these tools in your word processor: Different programs have different names for the feature. Check under the Tools or Insert menu. 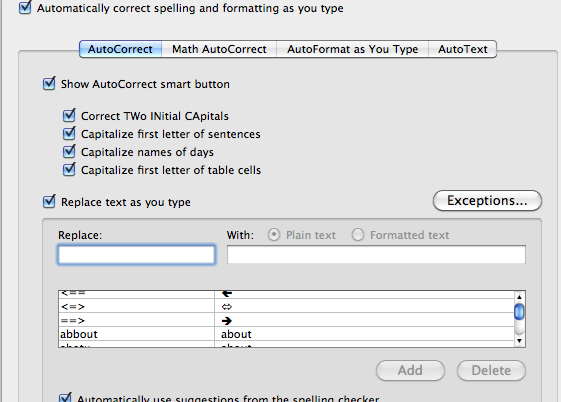 Other ways to automate and expand text: Check your computer or handheld device in the Preferences or Tools/Options settings to set up customized keyboard shortcuts. You can install apps for such functions as well. Sometimes when proof-reading a report or letter you may notice that you've misspelled the person's name in several places - e.g., McDonald instead of Macdonald. To make sure that you correct all instances of the misspelling, use the Find and Replace command (usually accessible from the Edit menu or by hitting <Control>F or <Command>F). Type the misspelled word into the first line of the popup box, and then the correct spelling below it. Click or press to "replace all." Done! Find and replace can also be used to fix punctuation errors such as double commas, or to globally change letter case or style. When you open a new file within Word and other programs, the document is already pre-formatted with margins, font type and size, line spacing and a few other parameters. These are all part of the default template. You can create additional templates for other purposes. Let's say your evaluation reports tend to have similar headings and blocks of text. Instead of rewriting these each time, make a special template for such reports. Simply create the outline or use a current report after stripping out client names and other non-uniform text (including from headers and footers) and save it as a template. Template files end in something other than .doc or .docx. In Word they end in .dot. Thus you might save an evaluation report template as evalreport.dot. Next time you need to write an evaluation report, open evalreport.dot from the Templates menu, and it will be populated with all the basic information. Set up additional templates to write thank you letters to referral sources, missed-appointment notices to clients, and other types of documents that don't vary much from one version to the other. Why a template? Can't I just open old documents and modify them? If you've never created a template before, you might be tempted to skip the learning curve and create a new report by modifying an old one. That will work; however, it will increase the probability of errors: First, if you're not careful to save the modified document under a different name, you might overwrite the original file. Second, you might unintentionally leave in content that is irrelevant to the current client - which could potentially constitute a HIPAA violation. Another use for templates is to add visual appeal. Create stationery designs. 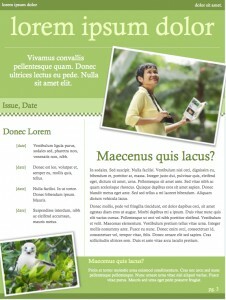 Customize layouts for brochures and handouts. The easiest way is to use one of the pre-designed templates within your word processing program. Or search online for templates compatible with the app you're using. Most pre-designed templates are customizable, so that you can change colors and move sections around. For example, in the two images below you can see the original template on the left, and the tweaked version that I created for a flyer. Alternatively, you can design your own template from scratch by setting up a document with fonts, lines and other style elements available from standard menu items in your word processing program. It will take you a while. But after you save it as a template, you can use it again and again.